Perhaps the daddy of them all in London, though we should point out straight away that 67 Pall Mall is a members’ club. If you are a member you’ll have access to an unrivalled list of wines, all of them sold at an eminently sensible price, and all expertly curated by Master Sommelier Ronan Sayburn. This masterly list is crafted “to excite, challenge and captivate” the club’s members, its amazing diversity and depth made possible thanks to 67 Pall Mall’s extensive sub-basement cellars, which allow it to hold thousands of cases of the finest and rarest wines in the world on the premises. Pricing is a fundamental consideration and works on the basis of a small cash mark-up, rather than a multiple of the cost price. Members make their wine choices on a searchable list on iPads which is packed with winemakers’ notes, tasting notes and critics’ scores. Further expert guidance is available from 67 Pall Mall’s team of 10 full-time sommeliers – possibly the best in London, including head sommelier Terry Kandylis (Moët UK Sommelier of the Year 2016, formerly Best Sommelier in Greece), assistant head sommelier Gareth Ferreira (UK Ruinart Challenge 2016 winner, Best Sommelier in South Africa 2016), Roberto Duran (formerly Best Sommelier in Spain) and Caroline Fridolffson (currently competing for the title of Sweden’s Best Sommelier). A section of Sommelier’s Recommendations presents an ever-evolving list of the crack sommelier team’s favourite wines. This section gives guests immediate access to an edited selection of wines from 67 Pall Mall’s 5,000 bin cellar. In addition, a massive 500 wines are available by the glass, including such drops of gods as Château Latour 1961, Harlan Estate 1997 and Sassicaia 1985, as a small sample or full glass thanks to Coravin technology. 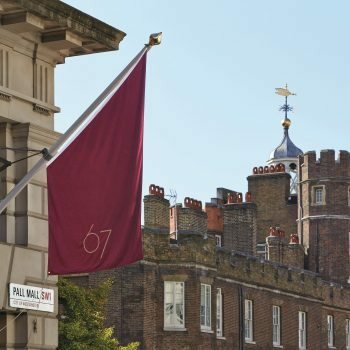 To view 67 Pall Mall’s full Wine List Confidential entry, including individual category scores and wine recommendations, click here. To view from all 350+ Wine List Confidential entries click here.